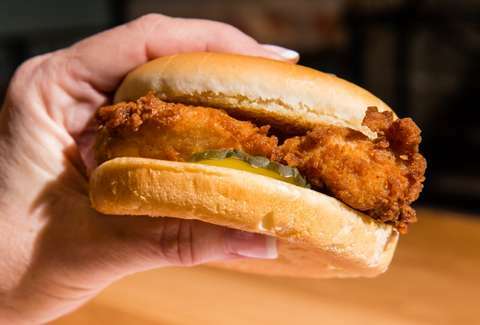 As if you needed a regular reminder that Chick-fil-A serves chicken sandwiches not cheeseburgers, the cult-favorite yet often polarizing Southern fast-food chain throws its annual Cow Appreciation Day (get it?) celebration. For more than a decade, thousands of people all across the country have flocked to their nearest restaurant for the day-long event, sporting cow-spotted clothing and accessories in order to earn free fried chicken sandwiches. This year's cow-themed feeding frenzy is just weeks away. When is Cow Appreciation Day in 2018? Chick-fil-A's official website reveals that Cow Appreciation Day 2018 will fall on Tuesday, July 10. From open through 7pm (local time), almost every Chick-fil-A location in the United States will treat you to one free entree if you show up wearing some sort of "cow-like" apparel. In previous years, scoring the free meal has been as easy taping printed cow spots to yourself or ordering a cow-print bandana that can double as a festive bib for when you start stuffing your face with waffle fries. Arriving with nothing but a cowbell in your hand probably won't cut it, though. Children wearing cow clothing will get a free Kids Meal. As for your free entree, Chick-fil-A said it will post a list of the options you can choose from in the days leading up to the event. The company's FAQ page, however, specifically notes that salads are not an option because Cow Appreciation Day is decidedly not about being healthy, or so it seems. The timing of this year's cow celebration leaves you with just a few days after the Fourth of July to trade your patriotic attire for something bovine, meaning you should probably get that full-body cow costume over to the cleaner ASAP. Unfortunately, the giveaway doesn't line up nicely with 7-Eleven's Free Slurpee Day (every year on July 11), like it did last year, so you may have to settle for some peach-flavored lemonade. Send news tips to news@thrillist.com and follow Thrillist on Twitter @thrillist.